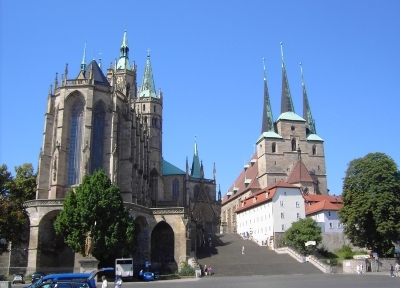 The Mariendom (Cathedral of St. Mary) and the Severikirche (Church of St. Severus) next to it, with their three towers respectively, constitute the landmark of Erfurt. The creation of St. Mary dates back to the 8th century. In the middle of the 12th century, the construction of the late Romanesque basilica consisting of three naves and two towers began. The tower in the middle came into existence about 150 years later. In the 15th century the basilica was replaced by the late Gothic hall building that still exists today. One of the most important parts of the building was erected with the extension of the choir in the mid-14th century. 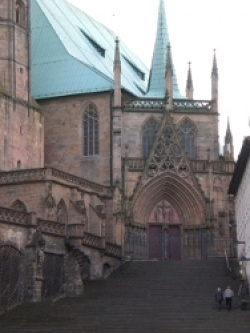 The traditional orientation of the choir to the east had been made possible through the construction of a three-storied substructure, aesthetically designed, at the hillside of the cathedral. Out of the fifteen windows of the choir, twelve still have their original coloured glazing from the 14th and 15th century. For special occasions, the "Gloriosa", one of the greatest medieval bells that are still in use, chimes in the middle tower. It weighs 11.450 kilograms and was expensively renovated in 2004.